Do you ever wake up in the morning with back or neck pain? If the answer is yes then you are probably using the wrong type of pillow. Poor spinal alignment and positioning whilst sleeping can result in undue stress being put on the neck and spine resulting in pain and discomfort. Use of an orthopaedic pillow however could prevent this giving you a great night’s sleep! 1 Why do I need an orthopaedic pillow? 2 Which sort of pillow do I need? Why do I need an orthopaedic pillow? On average we spend one third of our lives sleeping so choosing the right pillow is essential. A good night’s sleep will rest and rejuvenate the body leaving you ready to face the day ahead. Choose the wrong pillow however and the body quickly becomes misaligned. The result? Undue stress is placed on the neck and the spine which can eventually lead to problems such as imbalance, stiffness, spasms, and muscle cramps. While traditional pillows are too soft to offer much structural support, firmer orthopaedic pillows not only offer support but also contour to the body, relieve pressure and increase blood circulation to aid restful sleep. Used correctly an orthopaedic pillow can help alleviate pressure points on vulnerable body areas to significantly ease pain and discomfort. Which sort of pillow do I need? Everyone has their own personal preference when it comes to comfort. Whilst some people still choose a traditional type of pillow others prefer an orthopaedic or memory foam option. Indeed the majority of orthopaedic pillows on the market today tend to be made from memory foam thanks to its unique properties. Memory foam pillows absorb body heat and become contoured to our unique body shape whilst we sleep. When we adjust position the foam adapts to this new position for a perfect fit, comfort and support. 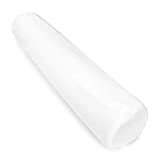 There are several different types of orthopaedic or cervical pillows on the market in all different shapes and sizes. It is important that you choose the right one for you to ensure that the spine is correctly aligned during sleep to prevent unwanted aches and pains. If a pillow is too high or too firm it will not allow your body to fully relax during sleep. Likewise a pillow that is too flat will place extra strain on the neck. With so many options available we have compiled a simple buyers guide to make things easier! These types of support pillow are specifically designed to provide orthopaedic and cervical support whilst you sleep. They support the neck’s natural curve whether you sleep on your side or back. Uniquely shaped they feature a central hollow to cradle the head and raised sides to provide extra support and maintain the correct alignment of the neck and spine. Cervical or neck pillows are widely recommended to treat general pain and discomfort, but also symptoms caused by strains, sprains and whiplash injuries. 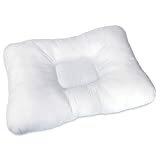 Cervical or orthopaedic pillows are available made from hollow polyester fibres or memory foam if you prefer. Most will fit inside a standard sized pillow case and this is recommended for hygiene purposes. Here are some of our favourites. Neck or cervical rolls are cylindrical shaped pillows designed to provide maximum support for the neck, shoulders and upper back. These rolls may be used in conjunction with your normal standard pillow to help relieve postural neck and shoulder pain, headaches and pain caused by whiplash injuries. Simply place the roll shaped pillow at the front of your existing pillow inside the pillow case. The neck roll will support your neck and upper spine whilst allowing your head to rest on the pillow itself in complete comfort. Used regularly, cervical or neck rolls have been shown to improve the quality of sleep to leave you feeling rested and refreshed. These are some of the most popular. Here we have outlined some of the many benefits of using an orthopaedic pillow. Hopefully we have also helped point you in the right direction when choosing the correct pillow for you. ← Back Pain? Are you sitting comfortably?